Joel 3:12 Let the nations be aroused and come up to the valley of Jehoshaphat, for there I will sit to judge all the surrounding nations. Israel… and they have divided up My land. It is a foregone conclusion as to the result of God’s land Israel. The nations have and will further divide the land. Humanity is a serial offender of dividing God’s land. France is expected to present a plan to the United Nations (UN) that would call for a nation, Palestine. The plan is to be presented in September 2015. It appears likely to be passed. Last year, the vote failed by one nation. Take it to the bank. Eventually, the land will be further divided. 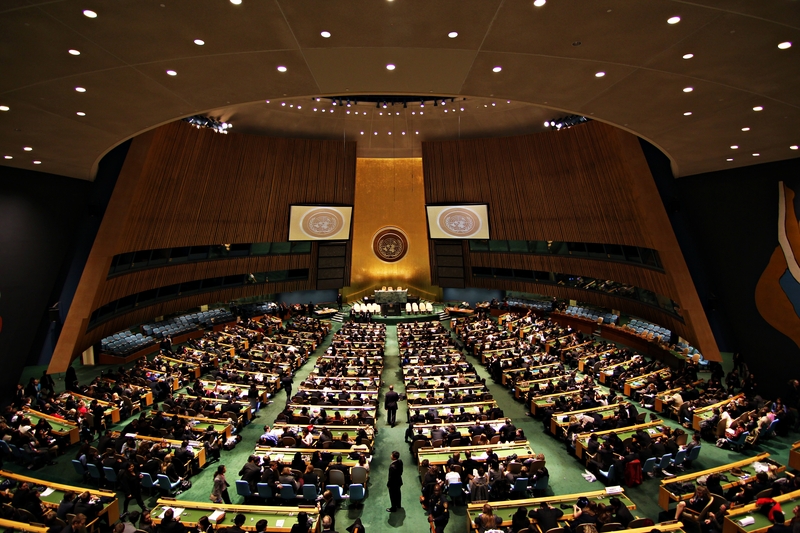 The start of the UN’s General Assembly is Tuesday, September 15, 2015. It is likely to be a who’s who of world leaders. Obama, Putin, Xi, and Rouhani are scheduled to speak. The Palestinians are asking to fly their flag at UN headquarters prior to the arrival of the Pope’s visit in late September, 2015. Typically, only member states are allowed to fly their flag. The United States and Israel are opposed. They say the flying of the Palestinian flag will undermine the “peace process”. The consequences of scattering God’s people and dividing His land are clear. He will gather the “nations” or goyim in the original Hebrew. Per Strong’s Concordance, the goyim are the nations or non-Hebrew people. The meeting place of the nations is defined, the valley of Jehoshaphat. The Hebrew meaning of the valley is “Jehovah has judged” (Strong’s Concordance). Some take this to be the valley between Jerusalem and the Mount of Olives to the east. It is also known as the Kidron Valley. At first glance, it would appear this modern day valley is not large enough to allow for the nations of the world to fit in such a small place (September 2015). Dwight Pentecost, Things to Come, has an excellent observation in light of Zechariah 14:4 In that day His feet will stand on the Mount of Olives, which is in front of Jerusalem on the east; and the Mount of Olives will be split in its middle from east to west by a very large valley, so that half of the mountain will move toward the north and the other half toward the south. When Jesus returns, the size of the valley is going to increase significantly. Geography of the land will change. …a very large valley… The Hebrew words for “very large” are m@`od (muchness, force, abundance, exceedingly, to a great degree) and gadowl (great and large in magnitude and extent). Definitions provided by Strong’s Concordance. I will enter into judgment… God will bring them to the “Jehovah has judged” and He is going to judge or shaphat in the Hebrew. Shaphat means judge, govern, vindicate, punish. The grammar in the Hebrew language indicates God will enter into judgment with the nations (Strong’s Concordance). The United Nations will not be consulted. This entry was posted on September 8, 2015 at 8:30 PM and is filed under Prophecy, Trend Update with tags God, Israel, Jehoshaphat, Joel 3, Kidron Valley, Palestine, United Nations, Zechariah 14. You can follow any responses to this entry through the RSS 2.0 feed. You can leave a response, or trackback from your own site.